How to resize a group of images in 3 easy steps? Is taking photos your biggest passion? No wonder, actually – iPad, iPhone and other brand-new full-featured devices made it super-easy to take high-quality photos. So, you must have thousands of images on your hard drive and even more to come! And what if you need to resize a large group of images? Well, you know firsthand how difficult it is to deal with that many photos at once. Moreover, it's time-consuming and rather boring. However, there are still grounds for hope. Meet ImBatch – the new program which solves most complicated problems within a short period of time. Let's say, you need to resize a large group of images. Here are 3 steps you need to make. Step 1. Start the program. You see that the interface is visually divided into three areas: the Tool bar on the top, the Working area on the left and the Task area on the right. Step 2. Drag and drop the photos on to the Working area (on the left) or use the special button to add all of them at once. As soon as you add photos, you can display the preview area as well. This is easily done by pressing on the "eye" button on the toolbar. Here you can see all changes happening to the photos. Step 3. Go to the Task area (the right-hand area) to choose the task. In the Task area we choose the needed task. In this case we choose "Resize" and "Save as". 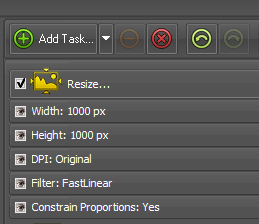 In the Resize option you set the task to the program – what exactly you need to do with the photos, what size of the photos you need to get. 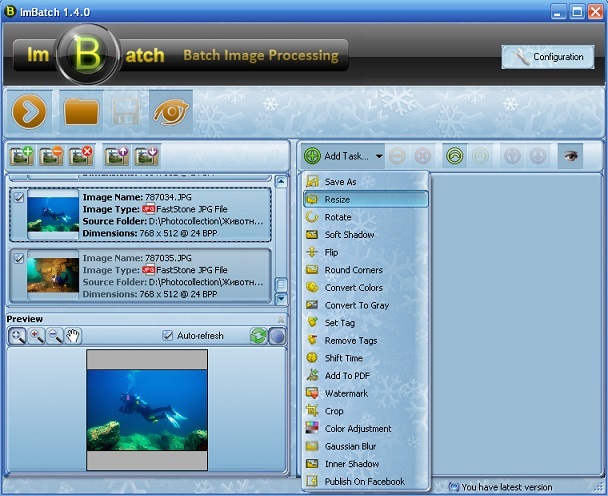 "Save as" task ensures that all the results are saved to the hard drive. It's so easy that it’s hard to believe! It's as simple as one, two, three! And it's FREE!